Global warming is a serious issue posing a big threat to our Earth. Its time we all get to understand the concept and make effort in our own possible way to prevent the disaster. Well, lets begin with the clarification of the basic concepts related to global warming. In short, global warming refers to an average increase in the Earth's temperature, which causes changes in climate. A warmer Earth may lead to a rise in sea level, changes in rainfall patterns, and can even adversely affect plants, wildlife, and humans. Earth is enveloped by a blanket of air called the atmosphere which comprises of several layer of gases. 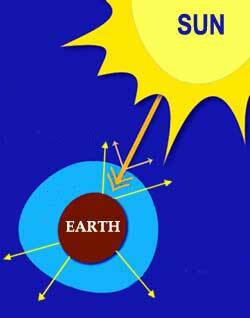 The sun's radiation reach the Earth after passing through the atmosphere. The rays from the Sun travels back into the atmosphere after warming the Earth. But the greenhouse gases prevent most of the outgoing infrared radiation from the surface and lower atmosphere from escaping into outer space. This process is called the "Greehouse Effect" and has kept the Earth's temperature about 60 degrees Farenheit warmer than it would otherwise be. Current life on Earth could not be sustained without the natural greenhouse effect. The name derives from the greenhouses which look like small glass houses, used to grow plants in the winter months. The glass panels of the greenhouse let in the sunlight and keep the heat from escaping which in turn helps the plant to survive the chill. Carbon dioxide, methane, halogenated fluorocarbons, nitrous oxide, ozone, perfluorinated carbons, hydrofluorocarbons and water vapor are the greenhouse gases. They absorb infra-red radiation in the atmosphere and make the Earth warmer by trapping energy in the atmosphere. Some of the activities of man are accelerating the damage done due to the greenhouse gases. Burning of fossil fuels like oil and coal releases carbon dioxide into the atmosphere, which in turn causes most of the warming. Another cause is cutting down trees or deforestation. Trees absorb carbon dioxide, one of the greenhouse gases, from the air. There are a group of greenhouse gases, called chlorofluorocarbons. They are used in the manufacture of aerosol sprays, blowing agents for foams and packing materials, as solvents, and as refrigerants. Their presence in the atmosphere, even in small amounts, can be dangerous because they can trap large amounts of heat. Increases in all these gases are due to mankind's explosive population growth over the last century, and increased industrial expansion. Do you know you are also contributing to the damage? You need electricity to perform many of these functions. 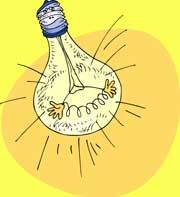 Electricity comes from power plants. Most power plants use coal and oil to make electricity. Burning coal and oil produces greenhouse gases. The effects of global warming are already being felt around the globe.It has a major effect on crops and weather conditions around the world. Sea levels - When many people think of global warming, their first concern is the possible rise of sea levels. With a large number of the world's cities in coastal areas, this is a crucial problem. There are two major causes of rising sea levels. First, extra water is produced when ice melts. Secondly, the natural expansion of sea water as it becomes warmer. The range of sea ice around both poles continues to shrink, as it melts. Even with the level of greenhouse gases present today, the earth may warm enough in the next 50 years or so to completely melt the sea ice located on the poles. Experts believe that global warming could increase the intensity of hurricanes by over 50 percent. Weather - Some parts of the Earth will become considerably dry, others will become wetter. There will be countless number of storms, floods and drought. Agriculture - Temperature increases may cause agricultural zones to shift northward, opening up new crops for some areas, while limiting them in others, where crops and livestock may be threatened by heat stress and drought. For example, food productivity in the tropics is likely to decline because many crops are already grown at their maximum temperature tolerance. Agriculture is also quite vulnerable to floods, droughts and hail, though these will vary regionally from year to year. Human Health - Global warming brings in its trail health hazards which include deaths from more frequent temperature extremes (particularly heat waves) and an expanded range of vector-borne illnesses (those transmitted by rodents and insects). Diseases like malaria are likely to become common in the United States and Europe. Plants and Animals - As temperature and weather changes, the homes of plants and animals will be affected at large. Polar bears and seals will have to find a new habitat if the ice in the Arctic melts. Many animals and plants may not be able to adapt with the climatic change and can die. 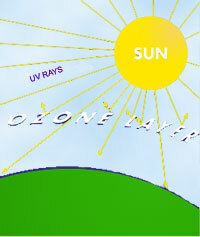 Ozone layer - The ozone layer is a layer of ozone gas which surrounds the Earth some 15 to 35 km above its surface. This 20 km wide layer acts like a natural filter and prevents most of the sun's harmful ultraviolet rays from reaching the Earth. Without this filter, more people would get skin cancer and eye diseases. Animals would also have been affected and so would farmers' crops and the top layer of our oceans. This beneficial natural ozone layer accounts for about 90% of all the ozone gas that exists. Continued global warming will accelerate ozone destruction and increase stratospheric ozone depletion. Ozone depletion gets worse when the stratosphere (where the ozone layer is), becomes colder. Because global warming traps heat in the troposphere, less heat reaches the stratosphere which will make it colder. Greenhouse gases act like a blanket for the troposphere and make the stratosphere colder. In other words, global warming can make ozone depletion much worse right when it is supposed to begin its recovery during the next century. Global warming is no doubt a grave problem but there are little things we can do to make a big difference. Remember conservation of energy is the keyword. Driving your car or using electricity is obviously not wrong, but just try to use it more sensibly. Carpooling is a smart option. Use a bicycle whenever you have to travel a short distance. It has twin benefits. Your cycle does not add to the pollution and you get your your regular exercise. Don't forget to turn off the lights when you leave the room. Turn off your computers when not in use. Less electricity will need to be produced and so less coal, oil and gas will have to be burnt in power stations, which means less air pollution and less carbon dioxide! Talk to your friends and family in order to create awareness about global warming and listen to what they have to offer as solutions. Offer to help your parents keep the air filters on your AC and furnace clean. Planting trees is a great way to reduce greenhouse gases. Trees absorb carbon dioxide, a greenhouse gas, from the air. Recycle cans, bottles, plastic bags, and newspapers. Recycling used materials uses less energy than making new ones. Sun is a veritable source of energy. Make good use of solar energy to heat homes, buildings, water, and to make electricity. Global warming is the greatest environmental challenge of the 21st century. Its about time we get conscious of our responsibilities and perform our duties to combat this environmental hazard.